For the past couple of years the Kentucky Derby and Cinco de Mayo have fallen on the same weekend. Historically, this could have created a conundrum as Derby Day was often the official kick off to bourbon season, and Cinco de Mayo was the kick off for tequila. In many ways, this past Derby/Cinco was an important milestone as both bourbon and tequila have transcended a “season” and are now enjoyed year round. The collision of these two major drinking holidays does create a difficult choice between sipping on the crisp, minty, bourbon-based mint julep for Derby or downing the citrus forward margarita for Cinco de Mayo. Eleven Madison Park, holder of a prestigious three Michelin stars, came at this problem from a completely different angle. Head bartender Leo Robitscheck, who also runs the bar program for Nomad, revisited the Manhattan for a variation that embraces both bourbon and mezcal in the same glass. The Verrazano takes the classic Manhattan (2 ounces of bourbon, 1 ounce of vermouth, and 2 dashes of Angostura bitters) and swaps out the bitters for Cynar, an artichoke bitter liqueur that balances sweet and bitter beautifully. 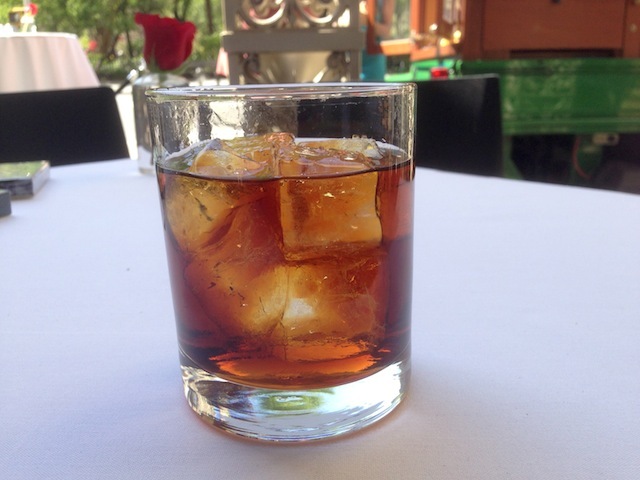 Instead of classic Italian sweet vermouth, the Verrazano subs in the spicier and fuller bodied Punt e Mes, which helps cut through the cynar’s sweetness and gives body to the drink. For the Verrazano, Leo Robitscheck went with the softer and sweeter Maker’s Mark. We often make our Manhattan’s with rye whiskey, but with Punt e Mes, a softer bourbon is the better choice. The real fusion of bourbon and mezcal comes in the glass with a mezcal rinse (or spritz), done in very much the same way that you would rinse a glass with absinthe for a sazerac cocktail. Like absinthe, mezcal can pack quite a punch, and when used sparingly, it can become a key supporting player in a drink rather than the star. Stir and strain into a mezcal-rinsed glass; twist and discard a lemon peel.